University is about 70 km away from New Delhi. You can reach this place by any means. By Air->> To reach Rohtak, one has to arrived at the Indira Gandhi International Airport in New Delhi. It is located at a distance of 80 km. from rohtak. All major international airlines provide their services to this airport. Prepaid Taxi’s are available on the IGI Airport New Delhi for Rohtak. By Road->> Rohtak is well connected to Delhi by Road. Frequent State Bus Transport services are available at the New Delhi ISBT Kashmiri Gate to Rohtak(75 km.). 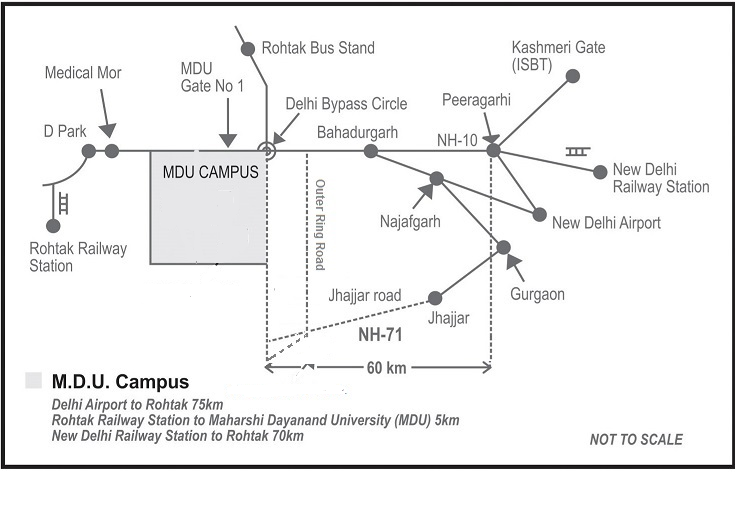 University is on the Delhi-Rohtak Highway (NH-10) Just beginning of Rohtak City, there is a junction called Delhi bypass so It is better to get down at delhi bypass circle. Across the road you will find a huge campus of Maharishi Dayanand University on your left. By Train->> Rohtak can be accessed from different cities of India through well developed railway network. To reach Rohtak by train from Delhi is very easy due to the highly-developed rail network. Rohtak falls under South Eastern Railway network. Express and Local Trains are available from New Delhi Railway Station to Rohtak. It will take an hour & thirty Minutes to reach Rohtak station. From Rohtak Railway Station take Prepaid Auto for M.D. University.